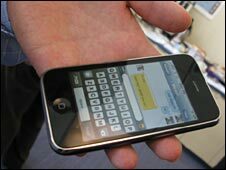 BBC NEWS | Technology | Is the mobile web coming of age? The strategies of companies ranging from Google to Microsoft and from Apple to Yahoo suggest they believe the future of the internet lies in mobile phones - but many in the industry believe the mobile web is still a long way from realising its potential. EBay's senior director of platforms and mobile Max Mancini told the BBC: "The first hype cycle on mobile failed because people wanted to recreate the desktop on the phone. "The mobile device is not an alternative view into the web. It is a different experience. "It might be an extension to different things on the web, but the real winning application on mobile will be the things that will be very unique to what you can get from a mobile device like the camera, the location, the address book and the communications." Ernest Doku, of comparison site Omio.com, said: "We should not be looking at replicating the desktop on mobile. "What people want on their phone is very different from what they want to experience seated in front of a PC." Jennifer Pahlka of TechWeb, which co-hosts the Web 2.0 conferences and summits, said: "In the past the industry has seen mobile as the second screen. "Developers have developed applications for the desktop first and then repurposed it so it's available on the phone. "We are seeing a big shift with the apps now just being made for the mobile device and people learning to use the phone in a number of different ways." There are about four billion cell phones in the world today, but the one that seems to attract the lion's share of attention is Apple's iPhone, despite the fact it is not the biggest player. According to research analyst Gartner, it has just above 10% of the smartphone market, while the world's biggest cell phone maker, Nokia, boasts nearly 41%. Nokia's Mr Vanjoki describes smartphones as "mobile computers"
But through its App Store, the iPhone is credited with helping customers learn to use mobiles for more than just making phone calls. 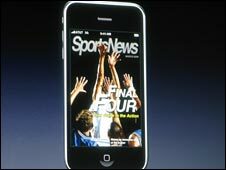 Recent studies have shown that 95% of iPhone customers regularly surf the internet. And Google has said it sees 50 times the number of searches using the iPhone than any other mobile device. Even Nokia acknowledges the iPhone has played its part in promoting the mobile web. 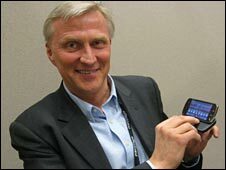 Nokia's executive vice president of markets Anssi Vanjoki told the BBC: "Steve Jobs did a great service for the digital industry by focusing the attention where we wanted it to be - on mobile and content. "More than one billion people have a Nokia device in their pocket. We see a big learning curve taking place with these so called mobile computers, which are about always being connected 24-7-365. "Everyone has an interest in mobile. And if we look at those four billion subscribers, the majority of growth is in the developing world. "We believe most of these people who experienced telephony through a mobile device will experience the internet through a mobile device." Sir Tim Berners Lee told the BBC: "In developing countries it's going to be exciting because that is the only way that a lot of people will actually get to see the internet at all." So just who is doing the best job in bringing the richest experience of the mobile web to users so far? While Mr Doku credits Apple and its Safari browser with doing "a decent job that is similar to the desk top in terms of ease of use", his money is on a newcomer due to come to the market in May. "The Palm Pre promises to be at the forefront in offering the best mobile web experience to my mind. "Having spent a short time with it, it has the potential to offer that step beyond what Safari is offering which is an integrated experience that is seamless." For some industry players, the key to success will be mobile phones becoming more "aware". Mr Mancini said: "It needs to know your location, your social connections, your social graph, your interests in certain things whether its commerce or events or music or whatever. "All of that will begin to converge and the phone that can deliver all of that easily will win." Google's vice president of engineering Vic Gundotra said the migration to mobile was a natural progression for the world's leader in internet search. "The entire world is moving to mobile and mobile is the most personal of all personal computers. They are increasing their importance and it has a dramatic impact on the future of Google." "This year we are going to sell more internet-connected phones as an industry than the entire notebook market. These devices will become our agents, support us with advice, be our friends. "Through mobile and Google we are going to make the world's information accessible and useful to everybody."